It’s back! 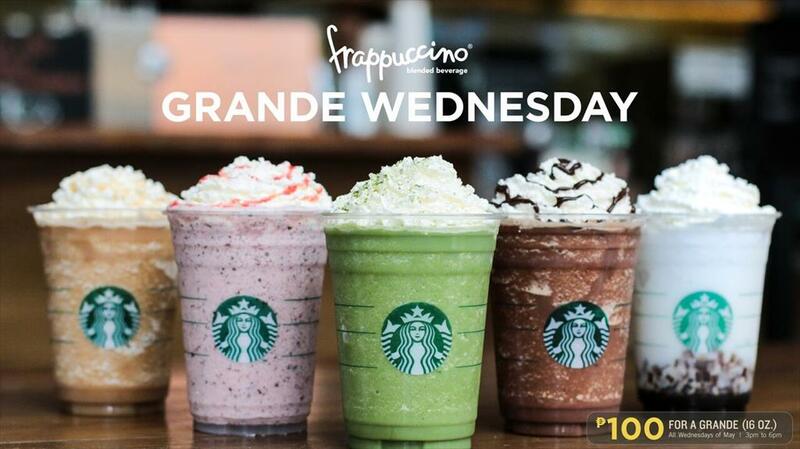 Starbucks Philippines is offering special customized Frappuccino blended beverages for only ₱100 for a Grande (16oz.) size all Wednesdays of May, from 3pm to 6pm. Your favorite Green Tea Frappuccino® is infused with sweet and buttery Hazelnut syrup to create a popular combination of flavors! Whipped cream and a dash of matcha powder complete this drink. Aromatic Almond syrup blended with milk and over our signature coffee jelly cubes make a light and refreshing Frappuccino® drink. This beverage is finished with whipped cream for just the right amount of creaminess. Frappuccino® chips dense with chocolate and coffee taste are blended into Vanilla Frappuccino® then mixed with sweet-tangy strawberry sauce for the perfect pink indulgent beverage! Toppings of whipped cream and strawberry sauce make this an Instagram-ready drink. Caramel lovers, rejoice! Caramel and Toffee Nut syrup blended into coffee Frappuccino® make a delectable concoction. Buttery-sweet caramel drizzle toppings contrast beautifully with the vanilla notes of regular whipped cream. You can’t go wrong with chocolate, mint and coffee. Our classic Mocha Frappuccino® with extra chocolate flavor is infused with mint syrup for a splash of cool complementing the intense coffee notes of this drink. Chocolate drizzle over regular whipped cream lend more chocolaty goodness to this beverage.